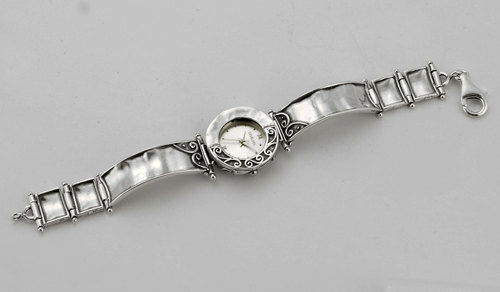 Hammered and oxydised sterling silver watch. Simple delicate and for any occasion this watch will suit all ages. A pressed pattern on the square setting surrounds the watch face which looks striking with a simple moulded band. The watch is about 18 cm long but we can make the watch to fit other lengths by adding or taking out links.